By far the two most respected individuals in their fields, Dravid and Kamal Haasan. Dravid showed his maturity and leadership skills during the fixing scandal that rocked his team and similarly Kamal handled the adversities surrounding Vishwaroopam with great aplomb. Shane Watson has the reputation of being a game changer and the same applies to Dhanush as well. Watson used his all round abilities to push his team to the Semis and Dhanush used his to achieve international fame. Dhanush's new venture coming soon. This page hosts a weekly slideshow related to Tamil movies. Each slide includes a picture and some description about that picture. All the slides will have a recurring theme. People looking for actress stills, actress images, actor stills, actor images, movie stills, movie images, and other interesting topics, relevant issues in Tamil cinema will find this page useful. 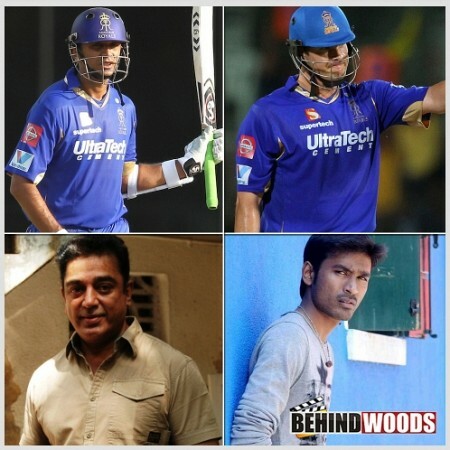 RR - Rahul Dravid - Shane Watson / Kamal Haasan - Dhanush | Who's the hero? IPL vs kollywood.